CheckTip (iPhone) - The best and coolest way to figure tips! ~ Android Forever! 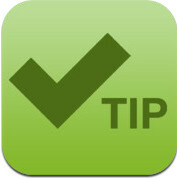 CheckTip (iPhone) - The best and coolest way to figure tips! Developer Quote: "Tired of pulling out your calculator to calculate the tip at a restaurant? Then try CheckTip. Simply take a photo of your check and CheckTip will use Optical Character Recognition (OCR) Technology to input and calculate your tip and check amounts." If you're going out to eat with friends and family during this holiday season you owe it to yourself to get this app. You can see from the screenshots what it does. It's not just a tip calculator. We're drowning in tip calculators! 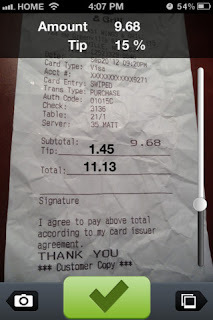 It scans your bill and shows you on the resulting pic the tip amount and total. How cool is that? -Slide the slider to adjust tip percentage -Your done! 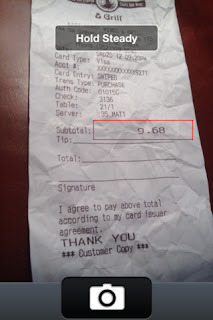 -Your tip and total percentages are shown ON THE CHECK! -If you want to adjust where the tip and total amounts are displayed, simply drag them where you would like. -Click the green check button to save the photo to your camera roll so you can keep it for your records. Click on the icon below to get CheckTip from the iTunes App Store!